Ya'll know I love her. 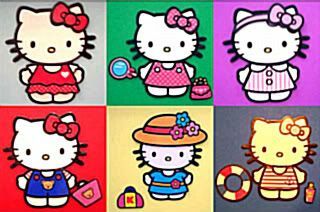 How cute is Miss Dress-up Hello Kitty in all these outfits? She belongs to a little boxset I recently bought - an amazingly cute number from Running Press. So many magnets, for under $7! I totally had a fun time mixing and matching the little outfits, and color-coordinating the paper. The grand master plan was that as soon as I posted this magnetset, I'd actually bring in the set to work, so that visiting kids can play with her. I just know if I keep her here at home, I'll end up playing with her outfits again. Mind you, I don't think it'll be that much different when I get them up in my cube. I've recently noticed that whenever I get stressed out at work, I start arranging and re-arranging my magnets. No joke, man. I'll be having a conversation in the pod, and I find myself shifting my magnets from place to place, finding the right niches for them and whatnot. They've sort of become my worry beads. Which is better than the stress balls that I'm wearing out at my desk. Rather, I can't use the stress balls because first, I find my hands squeezing so tight that they hurt like the dickens. And second, because I've also learned that I have a tendency to throw things like a five-year-old when I'm ticked off. Whether it's a stress ball, stress onion, or my blackberry is another question altogether. Anyway, so yes, this Hello Kitty set's coming in to the office today. Just in time for all the kiddies to go back to school. Good. All the more for me.